One of the primary goals of junior sailing programs should be retaining kids long enough for them to develop a passion for the sport and a personal desire to continue. Far too often, however, before that happens kids are asked to spend too much time (years) in boats that do not align with their version of fun and pressure to “succeed” comes much too soon. The current junior sailing recipe is driving kids out and resulting in an abysmal retention rate. The most common single-handed entry path into the sport, along with a continual decrease in the age when formal sailing classes start (from 8 years old to the now common 6), results in too many young kids having scary early experiences and too many years in the same type of boat. Pressure to showcase a structured, serious program that can produce top quality sailors cuts into the fun factor. “Racing pressure” sends kids that aren’t ready, to regattas too soon and to events that are too big; kids that show “potential to be good” are sent into the sport headfirst at the speed of light, and year-round. Not everyone drops out from these factors, and some will become amazing Optimist sailors and future Olympic and world champions, but meanwhile we’re losing too many kids before they have a chance to gain enough basic skills and have enough fun in boats to fall in love with all that sailing offers. I see the results of this problem firsthand through my role as a volunteer junior program chair at Sachem’s Head Yacht Club (SHYC) in Guilford, CT, talking to my own girls about what they like and don’t like about the sport, and through conversations with my sailor friends about their own kids’ experiences in junior sailing. Like most clubs in our area, SHYC offers junior instruction in Optimists and Club 420s, along with a few O’Pen BICs. We have about 60 kids in the program from ages 6 to 15, and offer 4- and 8-week programs. As the program chair, I find I spend hours and hours each winter and spring thinking about what the right recipe of offerings is, and it feels nearly impossible at times. How can we make our offerings attractive to kids and parents with the promise of structure, safety, skill building, racing opportunities, excellent coaches, and fun, and also more appealing than the many other sports camps, theater programs, travel experiences, summer jobs, and “screens” vying for the interest and commitment of kids’ time? But even if all the right solutions to our retention issues are not yet clear, it’s clear that for many kids floating around in a tiny, single-person box for three hours, multiple days a week, every summer from age 6 to 13 is not the right offering. Take a non-competitive kid, and layer on the thought of being asked to race that Optimist alone in classes and at regattas, and sailing classes sound even less fun. Or, consider the social tweeny-girl. I’m pretty sure most of them would say what they like least about Optimists is that there’s no one to talk to. Using the Opti as the primary trainer for the first five plus years of a sailor’s experience is a recipe for major and ongoing retention issues. Don’t get me wrong. Optimists can be great, and as we all know have produced hundreds of highly talented champions. When I was a kid and I heard about what Opti kids in other areas of the county were doing, when I was stuck in a Blue Jay in Long Island Sound, I was envious and thought I’d missed out. But now, as a parent of 10- and 12-year-old girls I’m struggling to keep engaged in the sport, I’m no longer sure the Blue Jay was that bad an option. Looking back on my junior sailing experiences, it was the laid-back, social aspect of sailing a Blue Jay with my friends that kept me returning each summer. We sang songs, threw seaweed at the boys and our coaches, laughed, and attended local regattas that we got to by being towed by our coach the morning of the regatta. It kept us happy and having fun long enough to get hooked and self-identify as “sailors.” At 15, we advanced into I-420s and started racing hard, traveling up and down the East Coast, vying for spots on the I-420 U.S. Worlds Team, and beyond. The Blue Jay has come and gone, but we can learn from the best of what it offered and apply it to what we should be offering today’s tweens and teens: a double-handed experience with a friend, a main and a jib, some sort of spinnaker, fun sailing classes, and simple local racing opportunities. We can all do better for our junior sailors. 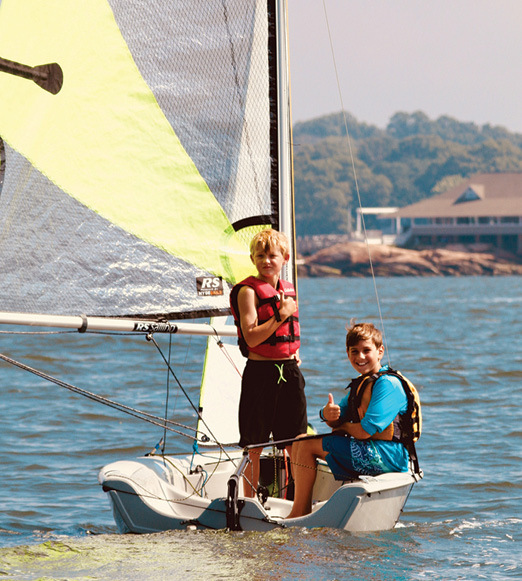 Over the past few summers, we have implemented several different new offerings to try to keep more kids sailing at SHYC. Some ideas have worked better than others. Here are three of our most successful options that other clubs might want to try. The first two are easy to implement, and don’t require any capital investment. We started the Recreational Path (called Adventure Sailing at many clubs) a few years ago. It’s been highly successful and has helped us retain a solid number of tween/teen sailors each summer. 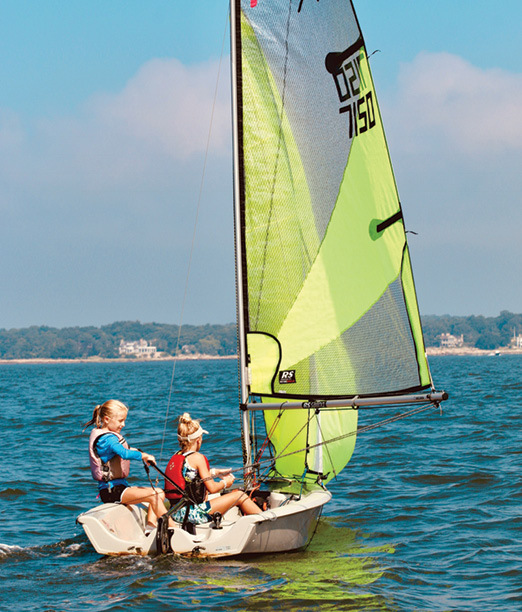 Its promise is no racing during classes, plus a varied curriculum, lots of on-the-water games, no pressure, fun, all double-handed sailing, and as much destination sailing as our geographic area allows. This class is selected by both boys and girls, typically ages 11-14 who like being on the water with friends, but aren’t interested in regatta travel and don’t want to compete. The Non-Travel-Race-Team was a new idea last summer. We piloted it with our RS Feva sailors. It was a big success, attracting mostly 10- to 12-year-olds, with the majority being girls. Most kids who selected this team had done the Green Opti Race Team in prior summers and found regattas and racing to be stressful and not much fun. The focus of this new offering was a weekly Friday morning learn-to-race class, followed by Saturday morning racing during our club’s traditional Saturday junior series. This team was similar to what other sports, such as soccer, call an “in-house” team. Their coach held fun Friday practices, helped the kids rig on Saturday mornings, and coached them on the water and between races in our club series. Our Non-Travel-Race-Team sailors, while they didn’t travel to regattas, still felt like part of our club’s JR SHYC Race Team. They attended the kick-off team meeting/dinner and received race team gear: team pinnies, team sweatshirt, and team backpack. They all enjoyed being part of the club’s race team, and the lack of pressure enabled them to find the fun in racing and learn without fear. By summer’s end these kids, many who claimed they didn’t like to race, were actually jockeying for spots to race our four Fevas in our Saturday morning club series! Most of these sailors plan to sign up for this same non-travel team again next summer, and a few plan to do the travel 420 team. Our venture into RS Fevas last summer was our solution for trying to retain ten or so kids in our program, ages 10-12, that had decided Optimist sailing wasn’t fun (because of the alone factor and not wanting to race), but they were mostly too small and too young to move into 420s. I did my research. At the 2018 US Sailing Leadership Forum, I demoed a Feva from RS Sailing and found it was easy to sail, fun, cool-looking, and underpowered – perfect for small tweens and teens. Also, the association adjacent to us, the Junior Sailing Association of Long Island Sound, already had almost 100 Fevas spread across a variety of clubs, and the feedback was very positive. But with a price point of $7,000+, an almost non-existent used boat market and no clubs in the Eastern Connecticut Sailing Association with these boats (yet), SHYC could not ask parents to go out and buy Fevas, especially for kids that were lukewarm on sailing. Like most mid-sized, volunteer-based clubs, we did not have the cash reserves to purchase a new fleet either. Fortunately, The Boat Locker in Bridgeport, CT is committed to growing junior sailing in our area and leases boats to help clubs grow new fleets. With assistance from owner Scott Hardy, we were able to lease four boats and our Feva program was up and running. We charged a “boat-access” fee to the Feva sailors/parents to offset the leasing cost, which seemed fair on all sides. By the second of week of sailing classes last summer, these morning Feva sailors, Avery included, were hooked back into sailing. Every day was Buddy Day! Sailing with a friend gives kids natural confidence, someone to laugh with, and makes on-the-water problems that arise not feel so scary. In no time at all, these kids could handle a Feva in a fairly wide range of conditions, sail to a destination, and were “popping” the asymmetrical spinnakers whenever possible. Most of these sailors were small, 60-85 pounds. We never would have retained them in Optimists long enough to be big enough for 420s. Both our morning and afternoon Feva classes were a huge hit – the kids always wanted to go sailing. Favorite activities included “popping the chutes,” practicing dry capsizes, playing games, conducting endless man overboard drills, pirating each other’s boats, and other on-the-water silliness. And these were the kids that were about to drop out of sailing the prior summer. Little did they know that all of these “fun” activities were building important sailing skills including balance, finesse, rescue, ensuring both skipper and crew could maneuver the boat alone, and problem solving (as the chute often gets stuck on the launch or douse). For summer 2018, we had 18 kids (about 25% of our total sailors) participate in our Feva classes. These sailors were 10-13 years old, about 2/3 were girls, and they weighed between 60 and 120 pounds with most under 85. Introducing Fevas retained more than ten kids that were on the verge of quitting our program (and the sport of sailing). Without Fevas, the choice they saw in front of them was several more summers alone in an Opti, and that was unappealing. We needed to offer a new option, to bridge the gap between their Opti foundation and the 420 ahead, and the Fevas were the right option. I think of the RS Feva as a “bridge boat.” Fevas are not meant to replace the Optimist or the 420. Instead they are an option to offer between Optis and 420s to help programs and clubs keep their tweens and teens in sailing. What a Recreational Sailing Class, a Non-Travel-Race-Team, and Fevas all have in common is that they are new options into the junior sailing formula. Options enable us to make our sport appealing to a broader group of kids who have a wider range of interests, skills, social needs, and goals. Offering new options should also come with the ability to make mid-season lane changes. Sailors should be able to fluidly move from one type of boat to another, from recreational to racing, or from racing to recreational. Sailors also benefit from being allowed to be in more than one lane at once: for example, being on the Opti Travel Race Team and in the Rec 420 Class. Lest you think I’m anti-Opti, here’s a personal story about the boat (and a first-rate program) coming to the rescue at just the right time. My oldest daughter Molly started sailing Optis at age 7. She wasn’t a huge fan but stuck it out for the summer because her friends were doing it (and we made her). The following summer, at 8, Molly was still lukewarm on sailing at best, but we put her back in the program and signed her up to race in our club’s Junior Optimist Regatta, which was scheduled in early July. It was a bit too windy that day and she didn’t want to do it, and she’d barely had seven days of sailing class that summer. The races were scary and confusing, she wasn’t ready, and she came in after just a couple races, in tears. That was pretty much the end of her sailing life for the next four years. She said, “No way” to sailing the next summer and begged to go to sleep-away camp. So off she went to a traditional outdoor-based overnight camp in Vermont for the next four summers! Surprisingly to all of us, when she got home from camp last summer, she declared she wanted to start sailing again because she was missing out on what her neighborhood friends were doing! She went with a friend to the Fall Open House Day at MudRatz (our local shoulder sailing season program), and decided to join their Optimist program. We’d sold her Opti years ago when she dropped out, but luckily we still had her sister’s Opti in the basement. The MudRatz were incredibly welcoming and supportive. They matched Molly up with 16-year-old Lily Flack for private lessons (which the MudRatz 420 sailors offer as a “volunteer give-back”). She had two lessons with Lily which were extremely helpful, positive and fun, and she felt ready to join the group MudRatz Opti session. So in this case, the Optimist came to the rescue as the perfect boat to meet the needs and timing of my daughter’s re-entry into sailing. It was easy for her to sail, she was the right size at 95 pounds, it was familiar from those earlier two summers…and she was doing it! My fingers are crossed that she’s our next win-back success story for the sport. Let’s work harder to offer tweens and teens more boat choices, more class options that don’t include racing, racing opportunities that aren’t a sprint to the pinnacle of our sport, and more fun double-handed experiences at a younger age. If we change the recipe, and sprinkle in some new options, we can retain youth sailors long enough to fall in love with sailing! A 4-time Collegiate All-American at Dartmouth College and a member of the U.S. Olympic Sailing Team in the Women’s 470 Class in the 1990s, Whitney Connor Peterson is now the Senior Vice President of Marketing at Gowrie Group, one of the nation’s Top-50 independent insurance agencies and the largest independent marine insurance group in the U.S. She lives in Guilford, CT with her husband and two daughters. This is the norm that hurts the sport. Big treat after completing drill for day is a ROAD TRIP where the kids just sail into the tide until time to turn around. OMG, is this what being a sailing parent in America entails? It looks like hell. Why don’t you buy a cruiser and take your kids sailing on it? Or why not moor it at the club and put the kids ashore in tents with their friends? My kids were taken cruising in the north of rainy Scotland in a 21ft cruiser for four or five summers. They never took up dinghy racing but they now all do kite surfing and white water kayaking. None of them are interested in racing anything except snowboards. Cadets (as they are called in UK yacht clubs) do a bit of very informal racing but mainly it is mucking about in Wayfarers, sandcastle building, walks in the woods, erecting things out of wooden poles and beach bbqs. Do any of them take up sail racing after university? No but they haven’t developed a life-long hatred of boating either. We have had one family with kids with serious international sailing potential in our club in the last ten years. They are currently burning up thousands of pounds and valuable years of their lives in pursuit of an Olympic medal. They are currently about 71st in their class on Europe but the dream goes on. The dirty little secret in sport is that there is one winner, perhaps three on the podium, the top ten perhaps and the rest are losers, failures. Meanwhile there are those who love sailing and only have enough time and money to do it properly once they are retired. I sympathised with the eight year old who was made to go Opti racing in a large fleet in a gale and came home in tears. I have that feeling most of the time after a race and I am 76. But I will go for a fun sail tomorrow, possibly taking several generations of my family sailing in the same 21ft cruiser that they were brought up in!